John Clegg's name will be familiar to those who have listened to BBC Radio 3 over the years - although I have missed his name in recent years. He studied with Herbert Fryer and after three years at Jesus College Cambridge made his London debut in 1951. He has toured widely. I cherish tapes of his broadcasts of the late Howard Ferguson's piano sonata, Medtner's Idyllica and Tragica sonatas and the Berkeley preludes. 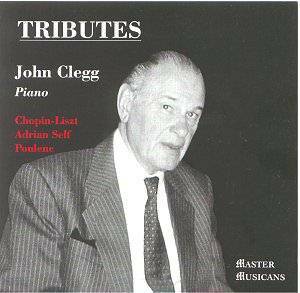 In the rarely-encountered Chopin-Liszt song transcriptions Clegg is fully attuned to the fragile qualities of the music: aristocratic elegance, slender beauty, romantic sentiment and Lisztian bravura. The six songs (Chopin wrote seventeen but Liszt transcribed only these six) are A Maiden's Wish, Spring, The Little Ring, Bacchanal, My Joys and Homecoming. Only in the tempestuous bass gusts of last song do you catch yourself thinking of Liszt. Otherwise these pieces might be authentic undiluted Chopin. Adrian Self was born in 1952 and his roots are in the far South West of England. Since 1990 he has been director of music at Cartmel Priory in the North West of England. His preludes are dedicated to John Clegg who plays with even greater fluency than he brings to the song transcriptions. Influence spotting can be a bit of a dead-end game but to give you some idea of the sound of these pieces (which were intended to act as tributes to various composers) I noted Chopin and Medtner (Preludes 15, 23), Bach (2, 14), Shostakovich (3, 18, 24), Ivor Gurney (4) and Debussy (4, 13). There is a deeply touching soliloquy (Prelude 6) humming with deep bell tones. The tenth prelude rocks with a gruff power while a benevolent light plays sweetly in Finzian gravitas over preludes 11, 17 and 22. No. 12 is murderously serious in and No. 19 breathes an air of unconfident sentiment - totally captivating. Other highlights include the jazzy impatience of No. 20 and the dewy spray of No. 21. The Poulenc suite is far from common fare. These eight portraits of friends gathered around Poulenc's 'adopted aunt's' house in Nazelles. The music is varied and subtle, aristocratically rippling, subtly perfumed and exotic (overtones of Szymanowski in Cadence), coquettish (Le comble); classically alert in the manner of Beethoven in La Suite; floatingly romantic (Chopin-in Gallic repose) in Le Contentement and L'alerte vieillesse, Satie and Shostakovich meet Parisian night life in Le Gout. In the Finale regal nobility brushes with Chopin, Iberian temperament, Lisztian display, carefree joy all dusted over with a touch (but only a touch) of sentimentality. A lovely disc. I detected only that Clegg seemed more at ease in the Self and the Poulenc. The piano sound is decently sonorous. Satisfactory notes. This disc will appeal to those who have invested in Lionel Sainsbury's piano CD. The Self Preludes will be of great interest to the pianists Jack Gibbons and Phillip Dyson. NOTE: Adrian Self will have his 24 preludes for solo piano premiered at Cartmel Priory, near Lancaster, England on 30 September 2000. Adrian is Director of Music at the Priory. The pianist is Lancaster-based John Clegg.